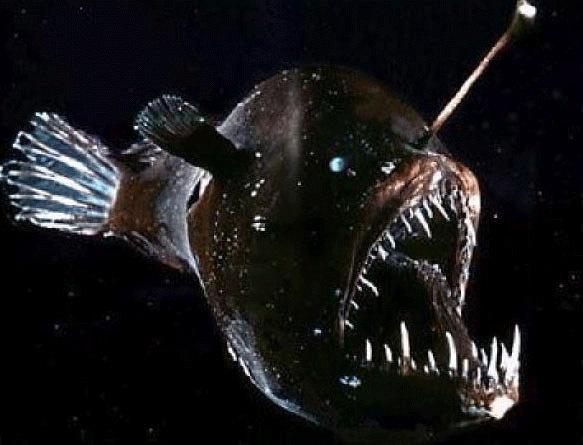 The Black Swallower is a deep sea fish notable for its ability to swallow fish much larger than itself. It lives in tropical and subtropical waters, in the pelagic zone at a depth of 700 to 2,745 meters below sea level. This unusual fish is small—none longer than 25 cm in length have been found. As their name suggests, they are black in color. They have an unusual jaw—the lower jaw extends past the upper and their single row of teeth interlock when they close their mouth to create an eating trap. When the Black Swallower preys, it eats its victim whole. It has a distensible stomach that can hold prey twice its own length and ten times its own body mass. Its hinged jaw has the capability of surrounding prey much larger than the Black Swallower’s head. As the Swallower eats, it starts at the tail and slowly walks its jaws up the fish’s body until fully consumed. But that it eats its prey like a some sort of aquatic python is a matter of supposition as nobody has ever observed the Black Swallower alive. Scientists don’t get to see these creatures in action, only as the result of a deathly case of indigestion. 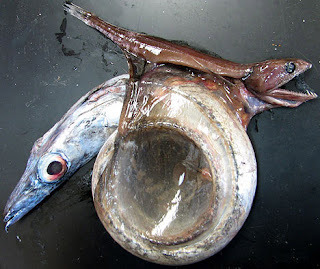 Usually the Swallower will bite off more than it can chew and swallow a fish so big that it can’t digest the whole thing. After a few days its meal starts to decompose and release gasses that get trapped inside the creature. Like a balloon, the extra buoyancy brings the fish to the surface where it can be collected and observed. more than it could chew—an 89-cm long snake mackerel. In 2007, a local Cayman Islands fisherman found a Black Swallower that had risen to the surface. In its stomach was a fish called a snake mackerel that was more than four times its own body length. This particular Swallower, at 19 cm in length, had eaten a fish that was over 86 cm long! Could this be where the saying “Never bit off more than you can chew.” came from? !